In this work Robust Fuzzy Principal Component Analysis (RFPCA) is used and compared with comparing with classical Principal Component Analysis (PCA) to detect and classify damages. It has been proved that the RFPCA method achieves better result mainly because it is more compressible than classical PCA and also carries more information, hence not only it can distinguish the healthy structure from the damaged structure much sharper than the traditional counterparts but also in some cases traditional PCA is incapable of discerning the pristine from damaged structure. This work involves experimental results using pipe-like structure powered by a piezoelectric actuators and sensors. Gharibnezhad, F. [et al.]. 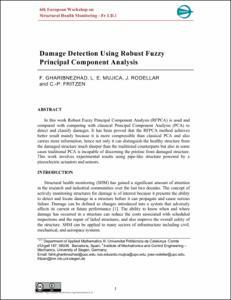 Damage detection using robust fuzzy principal component analysis. A: European Workshop on Structural Health Monitoring. "Proceedings 6th European Workshop on Structural Health Monitoring". Dresden: 2013, p. 1-6.